Our local zoo is free during the winter. Since we had a 70+ degree winter day on Saturday, we decided to take the boy out to see how the animals are getting along. All I was looking to get out of it were a couple of hours of family fun. What I got was the crumbling of the pillars of my understanding of the animal kingdom. Apparently, everything I thought I knew about animals and zoos is based upon myth. Here is a small sampling of how my world got turned upside down. 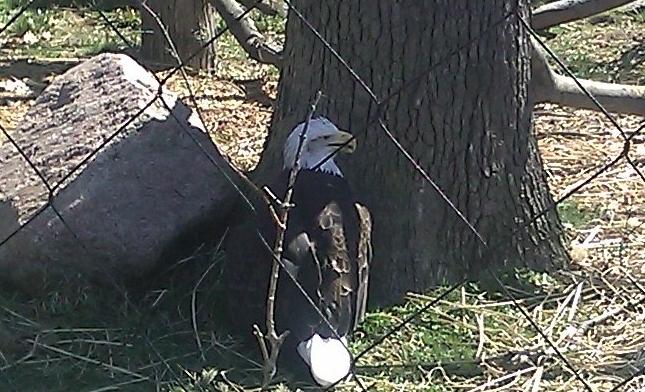 This eagle is anything but bald. If his head were black, he would be the Fonzi of the bird world. I don’t know, maybe back before Rogaine he had a receding hair-line. But after a few visits to the Bosley Treatment Center, his wavy locks are back. Now the lady eagles can’t resist him, and with the way he’s got it goin’ on, the species is in far less danger of becoming extinct. For your reference, this is a more accurate representation of bald and eagle. Bald – foreground. Eagle – background (lower right). Everybody sing: "I want to know what bald is. I want you to show me." We all know the respective reputations of the tortoise and the hare. Guess what? It’s all wrong. The tortoise did not win the race because the hare got cocky and lazy. The tortoise won because his speed was vastly under-rated and the hare was lazy long before he got cocky. In fact, I could find no evidence that hares are ever faster than tortoises. The hares were resting from a hard day of resting. One of them tried to rise, but his frail legs seemed unequal to the task and he lay back down. Another took a lethargic swipe at the back of his ear with his rear paw. He missed. Either his ear didn’t itch badly enough to make him care to take another swing at it, or he was just too sleepy. In the next fable I come across, I’m betting on the tortoise, even if the hare seems like he’s taking the race seriously. 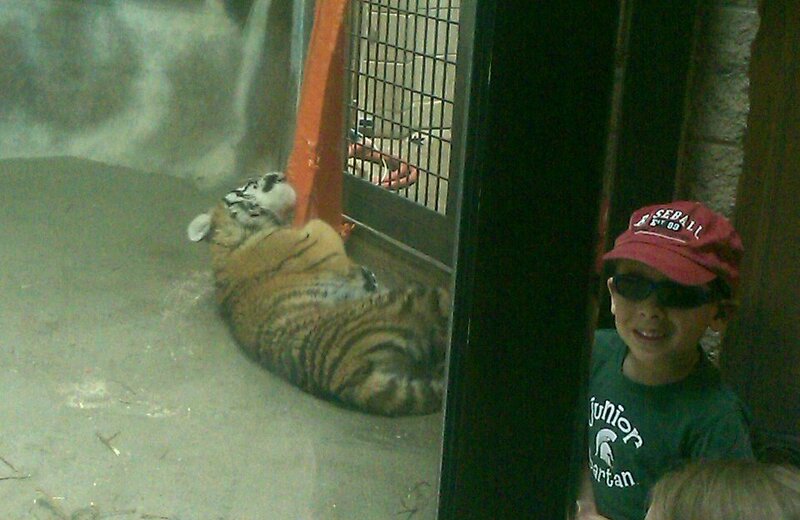 This is not 100% myth; my son did seem quite enamored of the tiger cubs. It’s not that he didn’t enjoy seeing the other animals, just that they didn’t inspire that special childish wonder within him. He was not at all above saying, “Okay, let’s see what’s next,” after staring down a lemur for a few seconds. That tiger cub is tearing up a plastic sled. If you are a zoo animal and you want to be a hit with little boys, kill or destory something right in front of them. To my son, the most fascinating aspect of our zoo is that it abuts a railroad track. Every so often, a freight train would roll by. No matter where we were, or what animal we were facing, my son would tug me toward the tracks. “I wanna see the train,” he said, as if there just happened to be this mildly amusing collection of animals right next to the most interesting railway line. If you want to know what it is that fascinates little boys, it’s trains. If a train happens to be transporting construction vehicles, the little boy is in nirvana. I now consider myself to be righteously disabused of my innocent fancies. 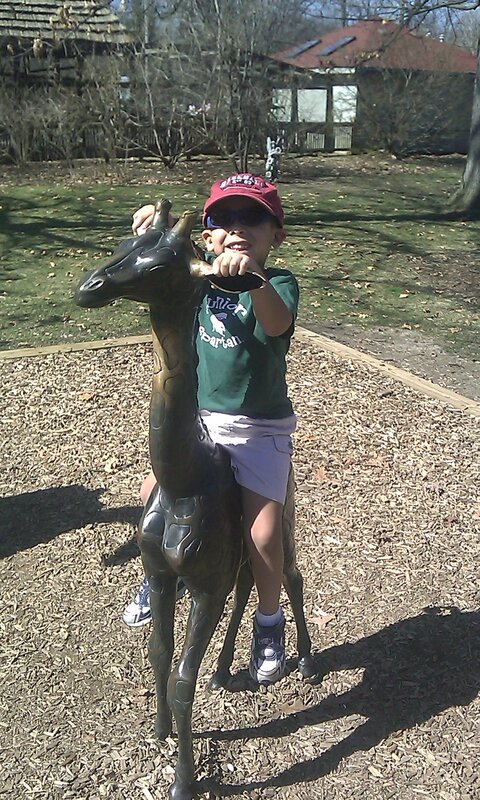 A boy riding a baby giraffe: one of the few things you can still believe in. 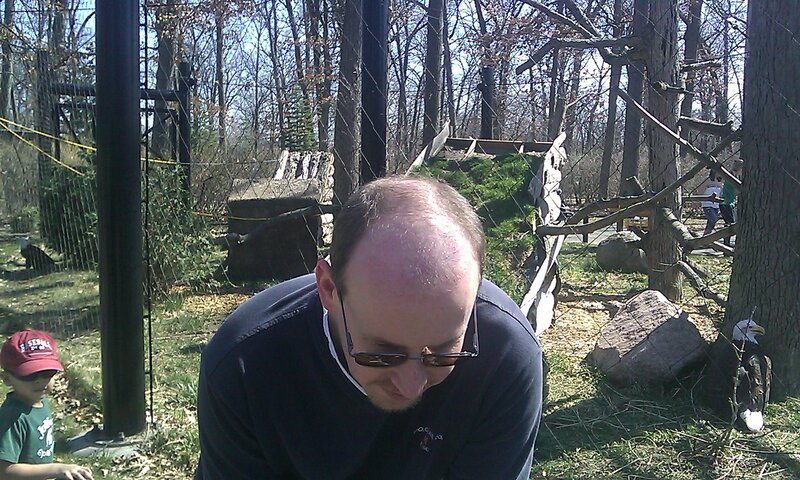 This entry was posted in Outings and (Mis)Adventures and tagged Bald Eagle, Fonzi, giraffe, Hare, humor, railroad tracks, receding hair line, Rogaine, tiger cubs, Tortoise, wavy locks, zoo. What a fun family outing! Thanks for sharing. Thanks for joining us on our adventures, Sandy. We haven’t been to the zoo yet, but I am guessing Gage will be way more into the trains. If the zoo had trains nearby. Guess that’s why we haven’t been to the zoo. There’s definitely something magical about trains – right up until the time when waiting for them at railroad crossings starts making you late for work.